This is the first American publication of three works by one of Eastern Europe's most original and inventive writers. 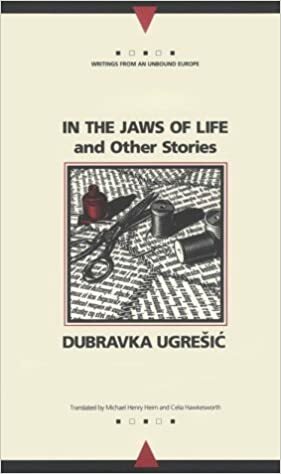 Dubravka Ugresic's In the Jaws of Life and Other Stories collects two short novels and a group of short stories grounded in fact and informed by fancy. The title novel, Steffie Speck in the Jaws of Life, charts the life of a typist for a lonely hearts column. Laid out like a sewing pattern, with instructions, diagrams, and helpful hints in the margin, it juxtaposes the cliches and trite advice of stereotypical women's magazines and popular culture with the genuine despair of the marginalized heroine. The short stories collected in Life is a Fairy Tale (Metaterxies) draw on the author's academic background to produce wickedly funny parodies and droll pastiches of such writers as Daniil Kharms and Gogol. Whether depicting the anonymous lives of small characters in big cities or rewriting great works from a distinctly irreverent perspective, Ugresic is fresh, entertaining, and consistently surprising.